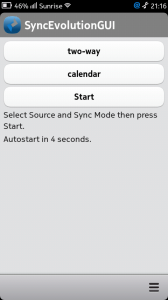 SyncEvolution-GUI is a very basic Graphical User Interface for the N9. It is basically only a GUI for the syncevolution command line tool. I tested it with OwnCloud and syncevolution 1.3. There is currently no configuration options available. All settings have still to be done in the config files as described here, http://forum.meego.com/showthread.php?p=35414 or http://talk.maemo.org/showthread.php?t=85868. When I use your app, the owncloud part is missing and the command fails due to unknown collection. Issueing the full command manually works. Any ideas? Could you make the source available? In ~/.config/syncevolution/config.ini you have to set default_peer to owncloud then all is well. thank you for this work; even though as of yet i have not been able to use it. 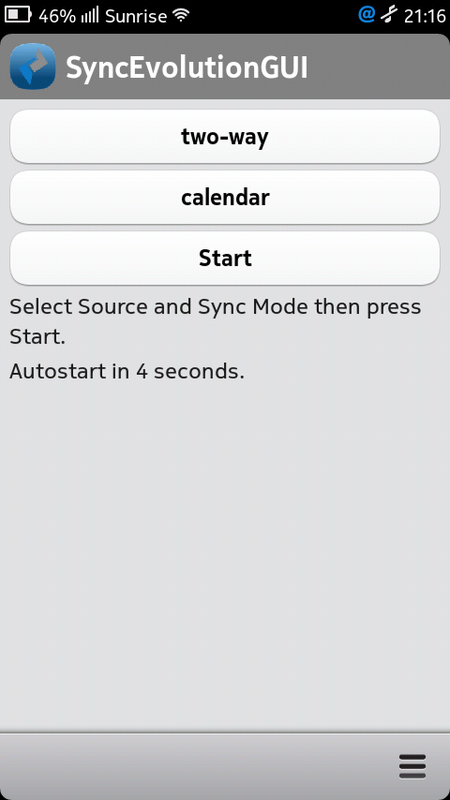 but i have an n9 + owncloud caldav sync that just stops working after awhile (to the n9, that is). looking for solutions, not sure whether i should go the syncevolution road or what. and eventually when sailfish os becomes available either on the n9 or on jolla’s own device i will probably switch to sailfish. Bee aware that he uses other names for the calendar and addressbook. I suggest to use the default ones so my GUI can use them! Nothing in particular, you give an good indication of what it’s lacking in your summary above. Perhaps some of that, but naturally only what interests you most, & what you consider most important for your usage. Also, part of the reason you’ve had very little interest, is that you don’t have a dedicated thread at TMO, were you’ve been fairly proactive etc. As it becomes much more functional/usable you’ll get more regular feedback, or contributions, or donations etc, & maybe eventually you can even release to Store. Nice work! But any plans to expand the utility of this app? Sadly its a lot of work to add more features and up to now only a few people are interested.